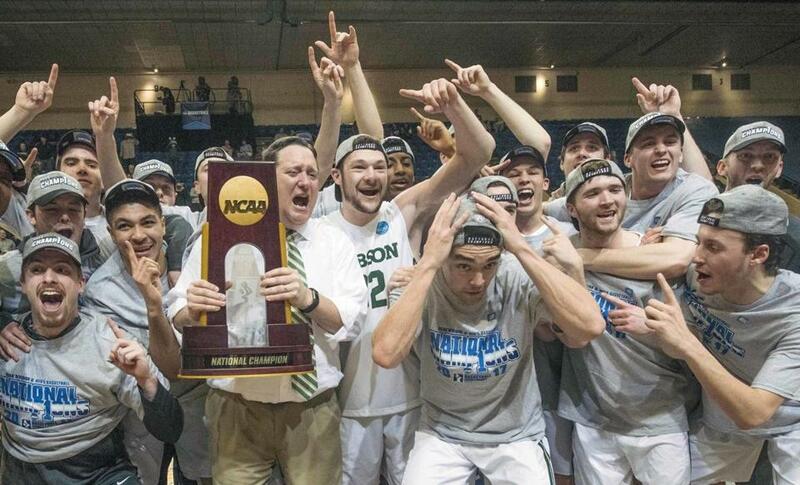 Babson coach Stephen Brennan holds the NCAA Division 3 men’s basketball trophy as his players celebrate in Salem, Va.
SALEM, Va. — Joey Flannery had one last thing to accomplish in his college career, and with the final seconds ticking down and Augustana’s Nolen Ebel threatening to take his national championship away, Flannery made one more play to make sure he could fill that final void. 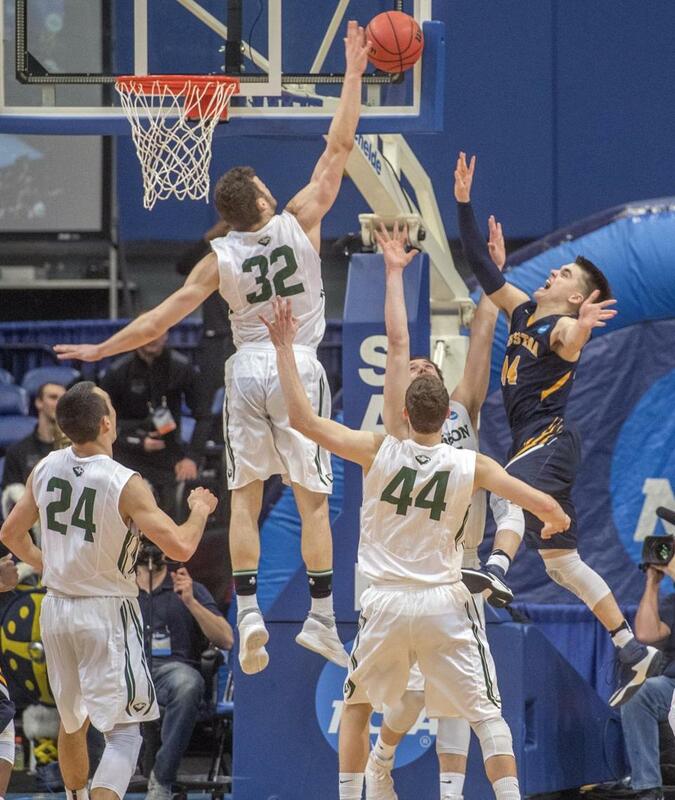 Last year’s national Division III player of the year scored 23 points and soared to block Ebel’s driving bank shot with less than 2 seconds remaining, preserving Babson’s 79-78 victory and its first men’s basketball national championship, on Saturday night. ‘‘He’d been getting to the rim on the right side all day and I said I’m going to meet him at the rim,’’ Flannery said of the block. The Beavers rebounded with 1.5 seconds left, and after Matthew Droney missed the front end of a 1-and-1, the Vikings called time out, setting up a full-court pass for a desperate heave. It was knocked away, preserving the title. ‘‘Winning your last college game, it means the world to me. It means the world to our seniors,’’ Flannery said. Joey Flannery (32) blocked Nolan Ebel’s shot with seconds remaining. Isaiah Nelsen added 18 points and Nick Comenale had 16 for the Beavers (31-2), who used a 25-3 run late in the final half to lead 41-31 at halftime, then held off a furious rally. ‘‘That’s not the first time he’s run down a ball to save a game for us,’’ Babson coach Stephen Brennan said of Flannery, who finished with 2,620 career points, including 47 in the two games at the Salem Civic Center. Viking coach Grey Giovanine had a different view, but the same sentiment. The Beavers, who reached the final by erasing a 45-20 deficit in Friday night’s semifinals, had never played for the championship before, but two years ago came to Salem Civic Center for their first Final Four. They lost that game, 68-48, to Augustana. Ebel scored 20 points to lead the Vikings (24-9). Jacob Johnston added 15 points and Chrishawn Orange had 14. ‘‘I thought I had a pretty good look,’’ Ebel said. Augustana had closed within four four times in the second half, but after Charlie Rice missed the front end of a 1-and-1 for Babson with 21.4 seconds to play, Jacob Johnston’s 3-pointer made 79-78 with 10.8 seconds left and the Vikings called time out. Flannery, an 84 percent free throw shooter, then also missed the front end of a 1-and-1 with 8.8 seconds left. ‘‘I’ll always be thinking about that missed free throw, but luckily it didn’t matter,’’ he said. Flannery, Rice and Comenale each played all 40 minutes for the Beavers, and Giovanine used nine players and his team played at a fast pace all game. He said that strategy has worked all season as his rotation included at least nine, but the setting foiled it just enough. ‘‘I love being on TV, but the media timeouts really hurt because of our depth,’’ he said. 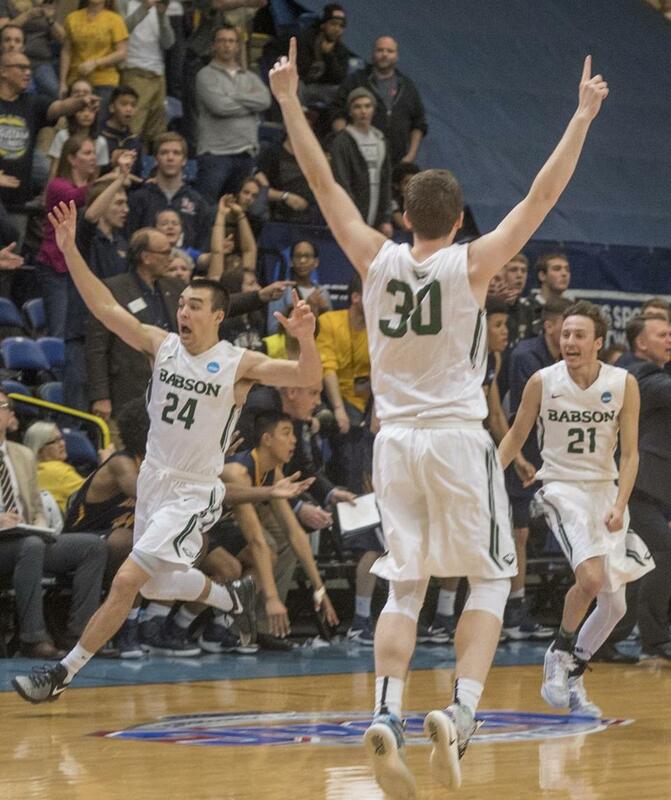 Babson's Charlie Rice (24), Nick Comenale (21) and Frank Oftring (30) celebrate the team's win.